Jagjaguwar announced yesterday the forthcoming release of Constant Future, the fifth full-length album by Brooklyn's Parts & Labor, available in the U.S. on March 8 and in the U.K. on March 7. 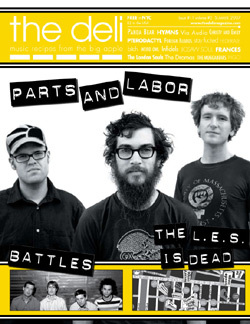 The band, featured on the cover of the 11th NYC issue of The Deli back in 2007 (side picture) can be called a sui generis totem of modern art-punk. Their last release, 2008’s Receivers, saw Parts & Labor blasting off in all directions and creating collage art from hundreds of fan-curated samples.The new album, co-produced by Dave Friedman of Flaming Lips' fame in his Tarbox Road Studios in Casadega, NY, promises to be one of the sonic events of 2011. Parts & Labor also took part in a recent fundraiser for The Voice Project organization which raises money to support the peace movement in Uganda. As part of the fundraiser Parts & Labor performed a cover of No Age's "Life Prowler" from their new album Everything in Between.